According to the UN's Food and Agriculture Organisation (FAO), rural women represented fully a quarter of the world’s population in 2000. Yet, despite their numbers, they face many additional barriers to seeing their rights protected and fulfilled when compared to their urban counterparts. Take the case of Colombia. The country has fairly strong legislation and public policy to promote gender equality. In addition to several laws prohibiting gender discrimination and violence against women, in 2012 the government announced a new National Policy on Gender Equity (Política Pública Nacional de Equidad de Género para las Mujeres), with implementation strategies. But what have these laws and policies promoting women’s rights achieved for the average, low-income rural woman? In Huila and Cauca, agricultural states that I visited over the last few months, the answer I heard was next to nothing. Which leads to a provocative question: could governments have more impact helping women by advancing the social and economic rights of the rural poor, rather than spending years formulating public policies specific to women’s rights? Some anecdotal evidence from Colombia supports the argument that prioritizing the social and economic rights of the rural poor may indeed better advance the broader agenda for women’s rights. In Colombia, women’s integration into a rural wage-earning labour market is severely hindered by the smallholder family farm as the country’s predominant unit of production. In the coffee sector, for example, the average Colombian producer’s crop is less than five sq. hectares and permanent workers are often not paid until crops are sold. In this context, governments can largely only support women’s economic empowerment by helping to support family incomes in the aggregate. Formalization of the rural labour force and promoting decent work agendas need to be at the heart of this effort. While we wait for these agendas to gain traction, key opportunities for the fulfilment of economic rights in Colombia include: expanded credit and better and more direct links to buyers in domestic and international commodity markets, on the one hand, balanced by government programs to support those that fall between the cracks—such as female heads of household and displaced families affected by the armed conflict—on the other hand. 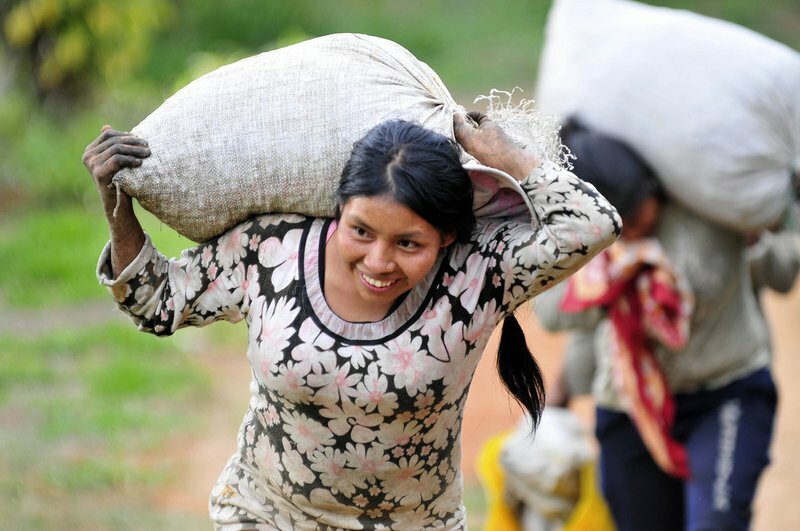 A female farm hand carries coffee beans in the Cauca department of Colombia. The female coffee producers involved in my research in Colombia had lower education levels, on average, than their husbands and common-law partners. Gender-targeted investments in training and education in rural communities would not only result in higher earnings potential (as women become more likely to afford child care) but the investment would also yield many beneficial secondary impacts for families (such as increased status of women within the family linked to their educational attainment). Many of the women I encountered during fieldwork in coffee communities were inclined to perceive their wellbeing as directly linked to that of their children. As a result, many had received extension services (training to improve crop yields) or technical training of some sort, but didn’t complete trainings because course schedules interfered with family obligations. As the 2011 FAO Women in Agriculture report recommends, ensuring extension services in agricultural communities aren’t discriminatory would help increase training completion rates among women. Of course, this goes hand in hand with the need to extend child care services in Colombia—another (if perhaps unarticulated) social right that would disproportionately benefit women. We need to promote women’s rights and fight discrimination in all its forms, as well as promote the social and economic rights of all. Women farmers surveyed by my project valued their health lower than that of the men in their families and were less likely to seek medical assistance than were their husbands. Only with better education outcomes for girls (to encourage women to seek assistance) and higher rural incomes (to be distributed more equitably among family members), will social norms like these start to change. For example, in our field workshops, adolescent pregnancies were identified as a common challenge, which higher secondary school completion rates among girls would no doubt help to reduce. More accessible health care in rural areas wouldn’t hurt either: Colombia has one of the highest maternal mortality rates in Latin America, at 83 deaths per 100,000 births. In reality, we need to engage both strategies in tandem. That is, we need to promote women’s rights and fight discrimination in all its forms, as well as promote the social and economic rights of all. Governments, including Colombia’s, would do better if they implemented comprehensive approaches (at various levels) to tackle gender issues. With the creation of a Presidential Commission (“La Alta Consejería Presidencial para la Equidad de Género”) to implement the National Policy on Gender Equity, Colombia embarked on just such an effort; now it needs to follow through on its promise. Unfortunately, President Juan Manuel Santos put the equity policy on the backburner following his re-election last year, leaving the Vice Minister responsible with an extremely downsized staff. Meanwhile, the women producing my favourite cup of imported Colombian coffee continue to wonder whether they will be able to afford the much-needed renovations to their houses. Perhaps next year. The research project referred to, “Achieving Gender Equality in Colombia: A Fresh look at the Coffee Export Sector,” was funded by the Government of Canada in 2014 and 2015.